The smell of baking coconut, manuka honey, and banana wafting from the oven was too heavenly to resist. I had to share this recipe. 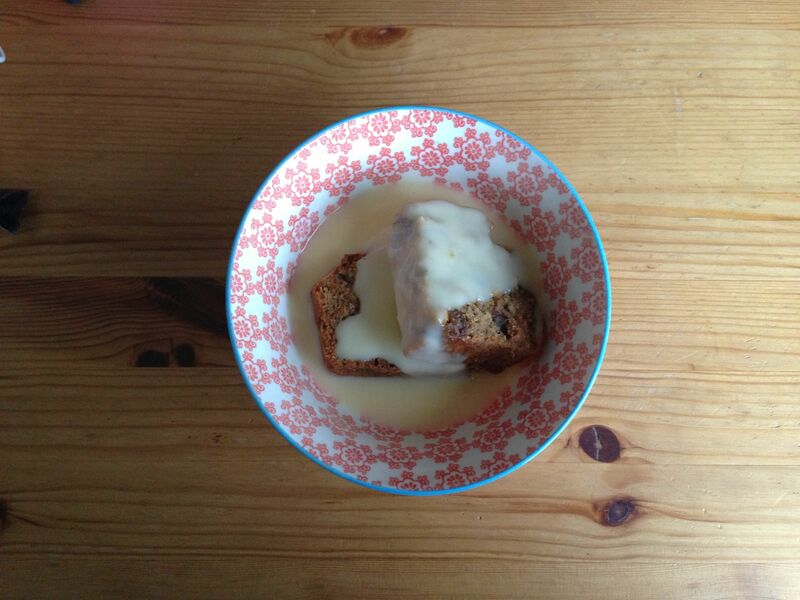 I had half a carton of buttermilk left over, so I decided to bake a banana loaf for the week’s snacks. The buttermilk, combined with baking soda would produce a nice, light loaf. Always thinking of how to make food healthy, yet full of deliciousness, I added coconut oil, manuka honey, and walnuts to the mix. Manuka honey packs a nice punch in flavour, especially in low-fat baking. And nuts are always a treat! Preheat the oven to 180˚C. Grease a 12cm x 22cm loaf tin. Combine the bananas with the honey and coconut oil. Then mix in the egg. Combine the buttermilk and baking soda. Add this to the banana mix. Next add the flours and spices. Mix until the wet and dry ingredients are just combined. Transfer the mixture to the prepared loaf tin. Bake for 45 minutes, or until the loaf bounces back when lightly touched and an inserted skewer comes out clean. Over the holiday season, everyone in the flat was away at different times, seeing family and friends. So I thought some form of connection over this time would be nice. How about gingerbread? 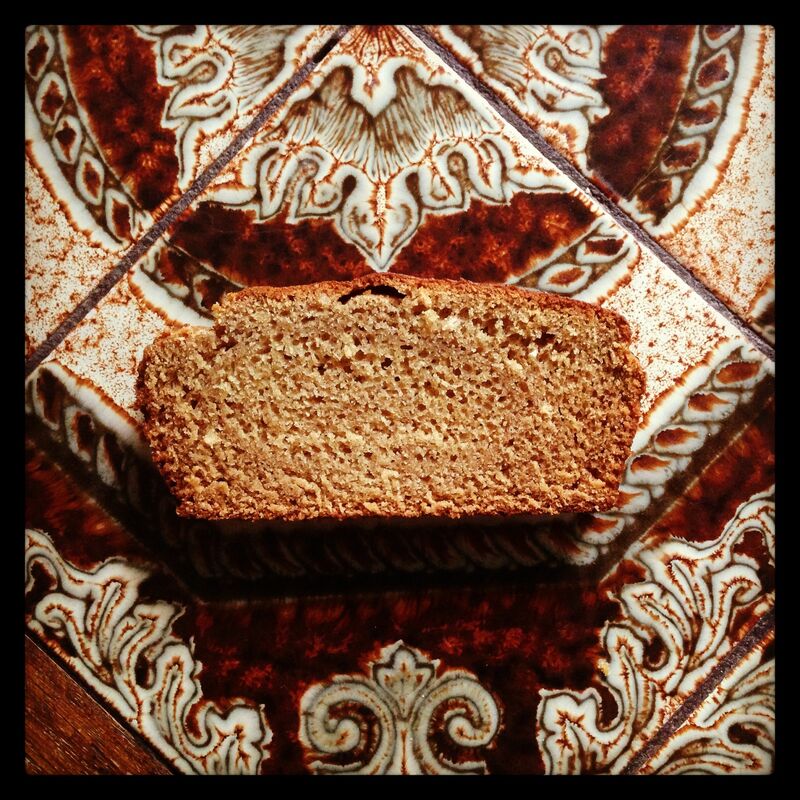 Jane Brocket’s gingerbread recipe (published as a ‘ginger cake’ recipe on guardian.co.uk) produces a dense, rich, gingery slice. It’s delicious served warm, or with tea. Instructions are easy to follow and will get you to a spicy holiday destination pretty quickly. And using only 85g of butter, you’re in no danger of filling your pants before Christmas! Eating healthily is important to me, but taste is a non-negotiable. Who wants to cook, let alone eat food that resembles cattle fodder or tastes like cardboard? So in my pursuit of flavour, and health, I learnt that loaf recipes which include dates are generally low in fat. Dates and their sticky goodness, contribute flavour, sugar, and moisture without adding copious amounts of sugar or fat. This led me to an Apple and Date loaf recipe on foodinaminute.co.nz. And from there, I developed my own variety of ‘date loaf’. I halved the butter – one tablespoon is enough to add flavour. Sometimes I use oil instead. To begin with, I left the sugar out, as the dates contribute enough sugar of their own. These days, I sometimes add golden syrup for depth of flavour and colour. To me, eating healthily also means maximising the nutritional the value of my meals, so I always use a blend of wholemeal and plain flour, which adds fibre as well. My variation uses more boiling water as I prefer a softer, lighter loaf. In a two-cup capacity jug, place the chopped dates, spices, and baking soda. Then fill the jug with the boiling water, to the top, covering the dates. Set aside to cool slightly. In a bowl, combine the butter, egg, and golden syrup (if using). Combine the flours and baking powder. Gradually add the date and egg mixtures to the flour mixture. The resulting mixture should be pourable, but not liquid. If you find the mixture is a bit stiff, add a bit more boiled water. Transfer the mixture to a greased loaf tin and bake for approximately 45 minutes. After about 40 minutes, test whether the loaf is baked. If the loaf bounces back when touched and an inserted skewer comes out (almost) clean, it’s done. You want the loaf to still be moist when you take it out of the oven. Cooked sticky date mix on the skewer is ideal. Raw batter goop on the skewer means you may need to exercise more patience! Once the loaf is cooked, remove it from the oven and leave it to sit in the tin for a few minutes. Then transfer it to a cooling rack. Slice when completely cold. Serve with a dollop of yoghurt or reheated with low-fat custard, for added protein. 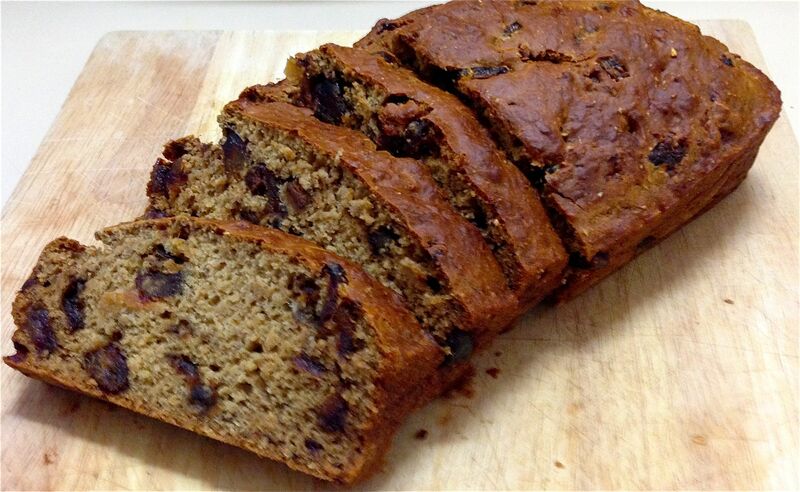 Banana-Date Loaf: Add a ripe, mashed banana to the date mix. Pear-Date Loaf: Add a chopped, ripe pear to the date mix. Berry Loaf: Substitute the dates and boiling water for a cup of berries, in juice. 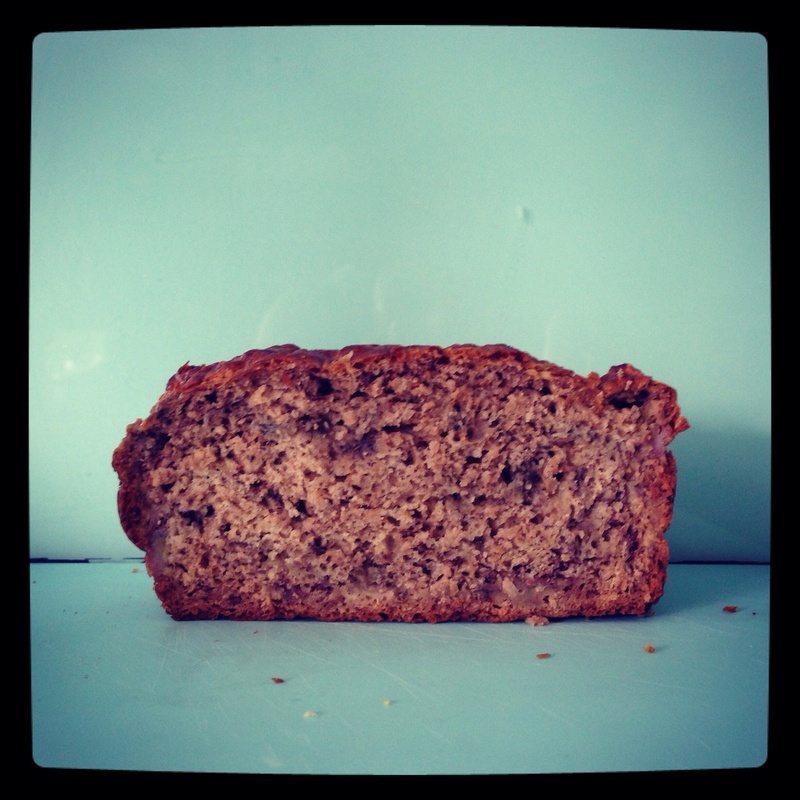 Ginger-Date Loaf: Add a tablespoon of ginger to the spice mix and include the golden syrup. Extra-spicy Date Loaf: Add other spices to the mix, such as cloves or a few crushed cardamom pods. Coconut-Date Loaf: Stir through some coconut (approx half a cup) at the end.